H. Jorissen, C. Skinner, R. Osinga, D. de Beer & M.M. Nugues (2016). Evidence for water-mediated mechanisms in coral-algae interactions. Proc. R. Soc. B 283: 20161137. I obtained my Master of Science degree in Biology with specialisations in marine biology, conservation and systems ecology at the Wageningen University, The Netherlands. 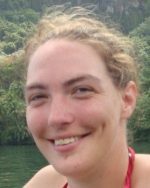 During my master thesis, I carried out 6 months of fieldwork at CRIOBE in Moorea, studying coral-algae interactions under the supervision of dr. Maggy Nugues. Currently I study coralline algae and their interactions with corals. My thesis is funded by the Labex Corail (project CORALINE). Coralline algae are not only major contributors in building reef frameworks, they also play an important role in coral recruitment. The project focuses on the close relationship between corals and coralline algae. Experiments in both field and laboratory environments, using ecological, metagenomical, transcriptomical and metabolomical approaches, will be employed to characterize the nature of the microbial and chemical interactions between the two holobionts. The results will help to better understand the structure and functioning of coral reef ecosystems, the interactions between organisms and the key roles of bacteria and biomolecules in marine environments.